eMDs is as a robust, flexible, and fully integrated electronic medical record solution that aims to optimize patient encounters and streamline the operations of clinics and medical enterprises of all sizes by simplifying the complex procedure and workflow of patients’ visits. As a fully integrated system, the software is using unified programs that work together such as charts, documents, intra-office communication, patient portal, schedules, and tasks. eMDs EHR software provides a comprehensive medical document management system supporting primary care and wide range of specialties that include Behavioral Health Care, Cardiology, Chiropractic, Internal Medicine, Physical Rehab, Pain Management, General Surgery, Neurology, OB/GYN, and a lot more. 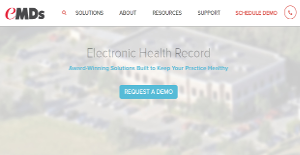 Loaded with a library of adjustable templates that can be used to match the specialty and workflow of physicians and medical practitioners, eMDs EHR software is accessible through the web or using a local server. eMDs EHR has a feature that allows users to easily drop information from a patient’s medical records of previous visits into current visit notes and vice versa. This feature can be observed when updating or adding information to a patient problem list. For instance, if the patient was diagnosed with classic migraine before and the current visit provides new information on such diagnosis such as its location, severity, and progress; physicians just need to tick some radio buttons on a pop-up window that would appear on the visit notes and the new information could already be added into the patient problem list. Because of eMDs EHR software rich templates, adding and updating of prescriptions is also made easy. If a new medication is needed, users could just quickly pick from a list of all the available and prescribed medications for a specific condition. Furthermore, when the visit summary is already accomplished and the diagnosis is completed, users could automatically add the information to the billing software. Through this feature, consultations are speed up and inaccuracies in updating patient medical record are avoided. Another feature of eMDs EHR software is its patient portal. As a secured point of interaction between physicians and patients, patient portal enables users to communicate with their patients and automatically email them any relevant information such as details of the diagnosis or a request for a call back. They could also add attachments into the portal such as laboratory results. With the objective of establishing and maintaining a personal touch in patient encounters, this feature optimizes patient care. If you are interested in eMDs it may also be beneficial to examine other subcategories of Best EHR Software gathered in our database of B2B software reviews. Companies have diverse wants and requirements and no software application can be just right in such a scenario. It is useless to try to find an ideal off-the-shelf software app that fulfills all your business requirements. The intelligent thing to do would be to modify the system for your special needs, employee skill levels, finances, and other elements. For these reasons, do not hurry and pay for well-publicized leading applications. Though these may be widely used, they may not be the perfect fit for your specific requirements. Do your groundwork, investigate each short-listed application in detail, read a few eMDs reviews, contact the vendor for clarifications, and finally settle for the application that offers what you want. How Much Does eMDs Cost? eMDs’ enterprise pricing information is available only upon request. Contact the company for more details, and ask for your quote. We realize that when you make a decision to buy EHR Software it’s important not only to see how experts evaluate it in their reviews, but also to find out if the real people and companies that buy it are actually satisfied with the product. That’s why we’ve created our behavior-based Customer Satisfaction Algorithm™ that gathers customer reviews, comments and eMDs reviews across a wide range of social media sites. The data is then presented in an easy to digest form showing how many people had positive and negative experience with eMDs. With that information at hand you should be equipped to make an informed buying decision that you won’t regret. What are eMDs pricing details? What integrations are available for eMDs? If you need more information about eMDs or you simply have a question let us know what you need and we’ll forward your request directly to the vendor.